Britannia has launched a low cost chocolate chip biscuit in its Tiger brand . Tiger brand has been pitched basically by Britannia to take on Parle G . Tiger glucose biscuit had some success in getting glucose market share . Britannia has since then tried to add many low cost variant for mass glucose segment with Tiger cream , Tiger Cookies and now Tiger Krunch with choco chips . Idea is to provide premium product with low cost tag to large customer base including rural market . 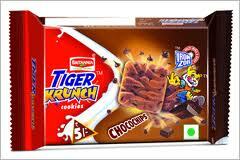 Tiger Krunch is priced at Rs 5/- bracket .